This patient came to us with an unattractive poor quality crown and bridgework. 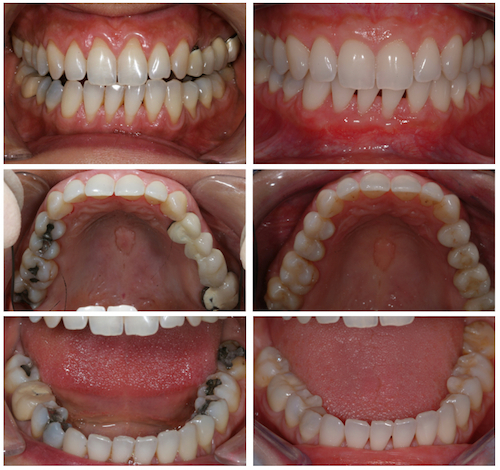 She was missing two upper lateral incisors and the previous bridges looked artificial and quite unlike real teeth. After root treatments, dental implants, gum and bone rebuilding, new porcelain crowns and some porcelain veneers we achieved a beautiful, natural-looking result. She now has the smile she’s always wanted, and individual teeth that look and feel entirely natural. This 39-year old lady had gum recession and some poor quality old fillings, crowns and bridges that were now defective. She was unhappy with the look of her teeth and smile and wanted to improve both the condition and appearance of her teeth and gums. She was also experiencing discomfort from poor quality bridgework and sensitivity from her exposed roots where the gums had receded. We achieved a terrific result by replacing her old fillings with new tooth-coloured fillings and replacing her old crowns with new high quality crowns. The defective bridge was replaced by individual crowns on the two supporting teeth and two dental implants for the missing teeth, whilst the gum and shrunken bone in that area were rebuilt to create a natural gum profile. The treatment made the whole area far more comfortable and much easier to clean as she now has individual teeth that can be brushed and flossed normally. The gum recession was corrected by root coverage and tissue grafting, and lastly her teeth were brightened up with some tooth whitening. It’s an excellent example of how inter-disciplinary treatment can optimise both condition and aesthetics. This middle-aged lady’s smile was very compromised by an uneven gum line and worn, discoloured teeth. 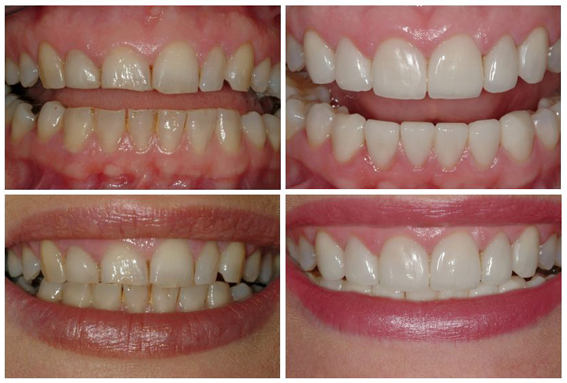 A beautiful result was achieved by reshaping the gums and restoring her teeth with porcelain veneers.